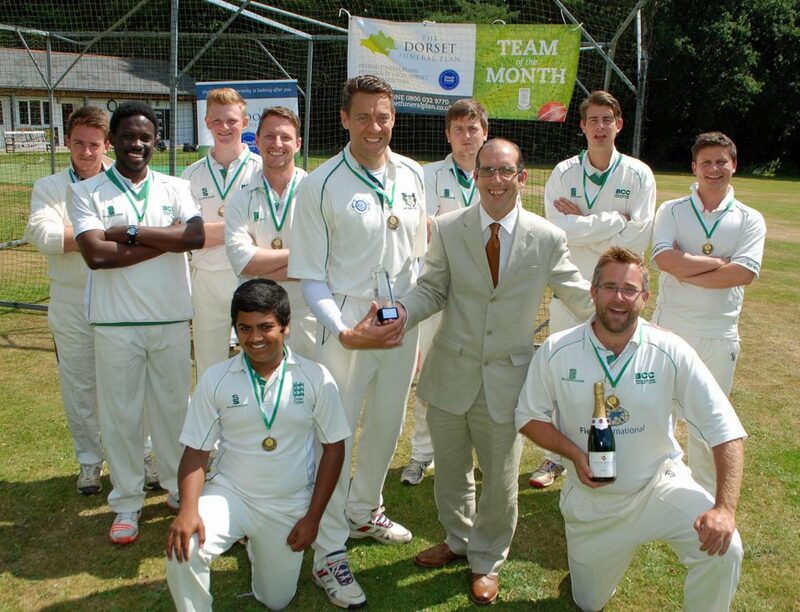 Broadstone Cricket Club’s first XI won July’s Team of the Month award for the Dorset Funeral Plan Dorset Cricket League after a month of success. The team has introduced a number of youngsters into the side and they helped the team dominate matches in the Premier League. During the month they achieved success against Martinstown, Swanage, Stalbridge and Weymouth cricket clubs. Derek Trotter from James Smith Funeral Directors in Swanage – which is part of the Douch Family Funeral Directors that runs the Dorset Funeral Plan – presented the team with the trophy. Players received individual medals and they were also presented with a bottle of bubbly. Mike Holm, the team’s vice captain, said: “It was great to receive July’s team of the month, as throughout this period everyone who played contributed towards the success of the team. “This period included debuts for several under 14 and 15 players who stepped up and enjoyed the challenges, getting their first Premier League wickets and runs, which we hope to the start of many more. “Under Steve Trembath’s captaincy it was an environment where fun was the aim and results were not the priority, but this gave freedom for batsmen, bowlers and fielders to excel.